Plans are moving like clockwork for your big event. The invitations went out. You’ve planned the menu and decor. What’s next? Think about coasters or beverage napkins, especially if you are entertaining at home and want to protect your tables and other surfaces where guests will land their drinks. Want the latest, greatest party idea? Consider coaster napkins, Giftsin24.com’s newest product addition. As their name implies, these products combine the best features of coasters and napkins, all at an affordable price. 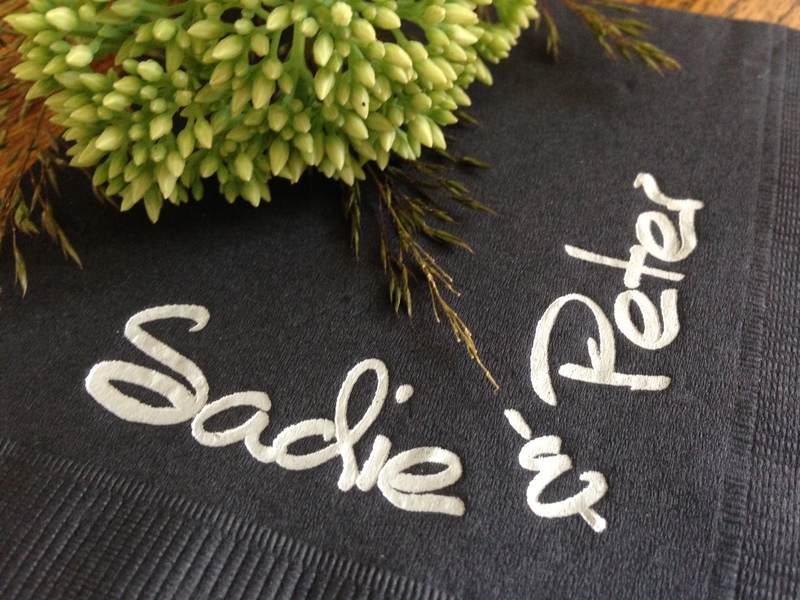 Personalized beverage napkins are wonderful and offer flexibility. For a modest investment, you can announce the reason for your celebration at the dining table, beverage cart and buffet. Coaster napkins add an advantage: Sturdier and more absorbent than beverage napkins, coaster napkins won’t shred when wet and will stand up to multiple uses. Compared with coasters, coaster napkins also save space and are cost-effective, especially if you are expecting more than 10 guests. Investing in dozens of cork or glass coasters would add to the cost of your party, plus they’d have to be stored in between events. 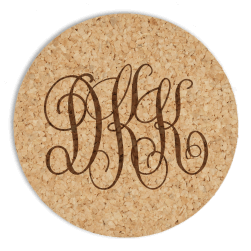 It’s easy to personalize coaster napkins with popular Giftsin24 monograms, lettering styles and designs. 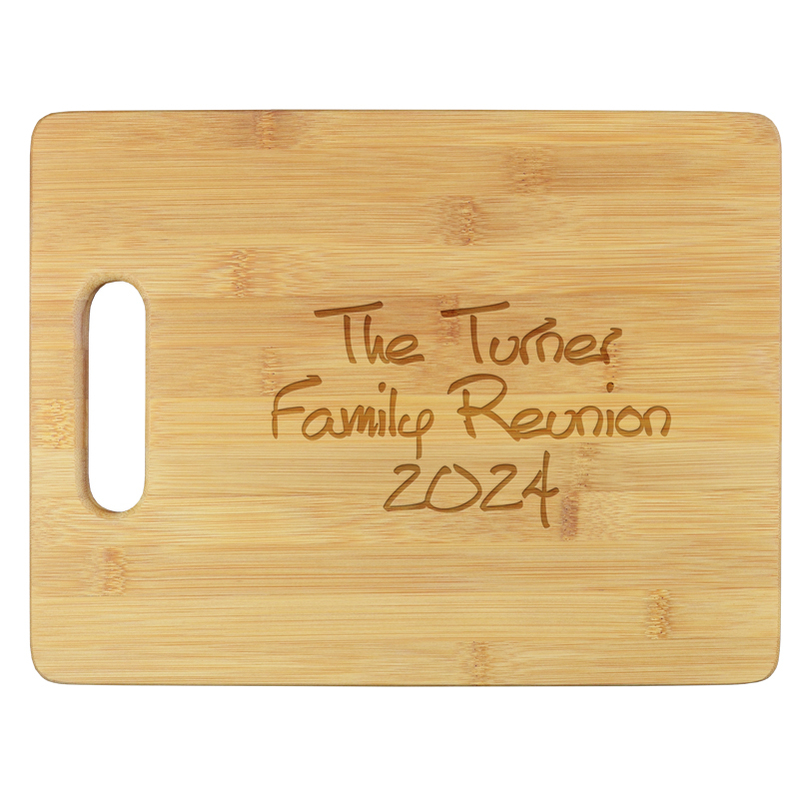 Personalize them for weddings, showers, anniversary parties, birthday celebrations and other special events. The 4-1/8” x 4-1/8” squares work equally well for hot or cold beverages. Made from textured paper that has a bit of latex in it, they stay in place, won’t shred and will even look pretty for a second or third event. The white paper has a linen-like finish, which lends it some texture and a slight sheen. Even when wet, the coaster napkins stay attractive because the personalization does not rub off. 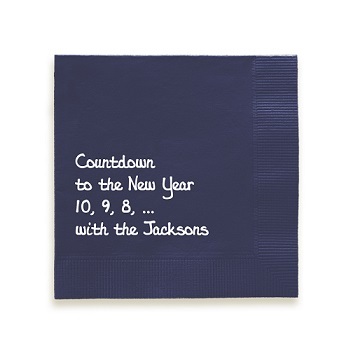 Explore the collection of coaster napkins now so you can personalize them for your next party. Spring is here, and it’s time to add some soft pastels to your table for the new season. Maybe you are planning an Easter luncheon with family. A baby shower for your favorite sister-in-law. Or a birthday party for your son. Personalized spring party napkins help announce the theme and tie your table decor together. We have a pleasing palette of paper and foil colors that will brighten any party. Joyous Napkin. 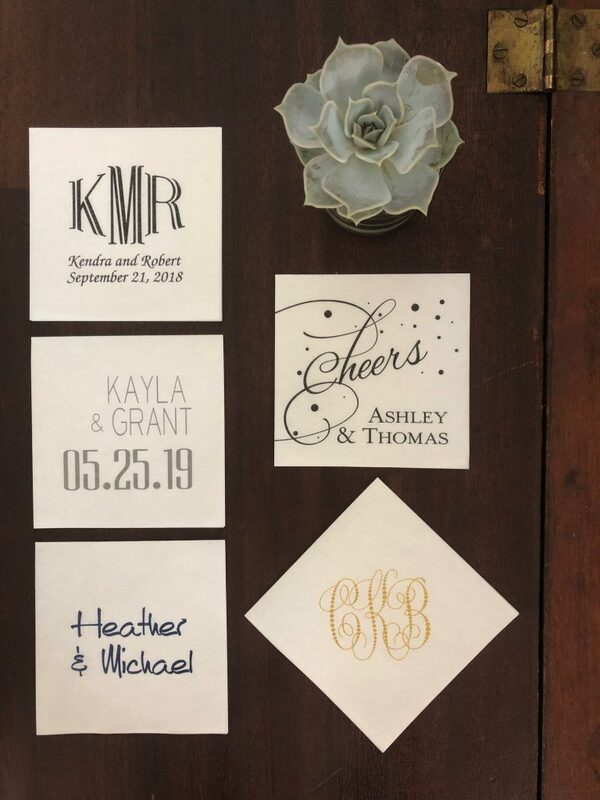 Tell everyone why you’re celebrating at your spring party with four lines of personalization in the font of your choice. These napkins come in a large array of colors and vivid foil hues to match your spring theme. Select a white or ivory napkin with a pastel foil color, like pink, teal or mint green. 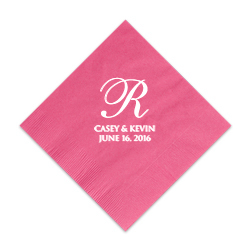 Or, choose a coral or classic pink colored napkin with black or white foil lettering.High quality, three-ply construction. Square orientation. Bordered edge. 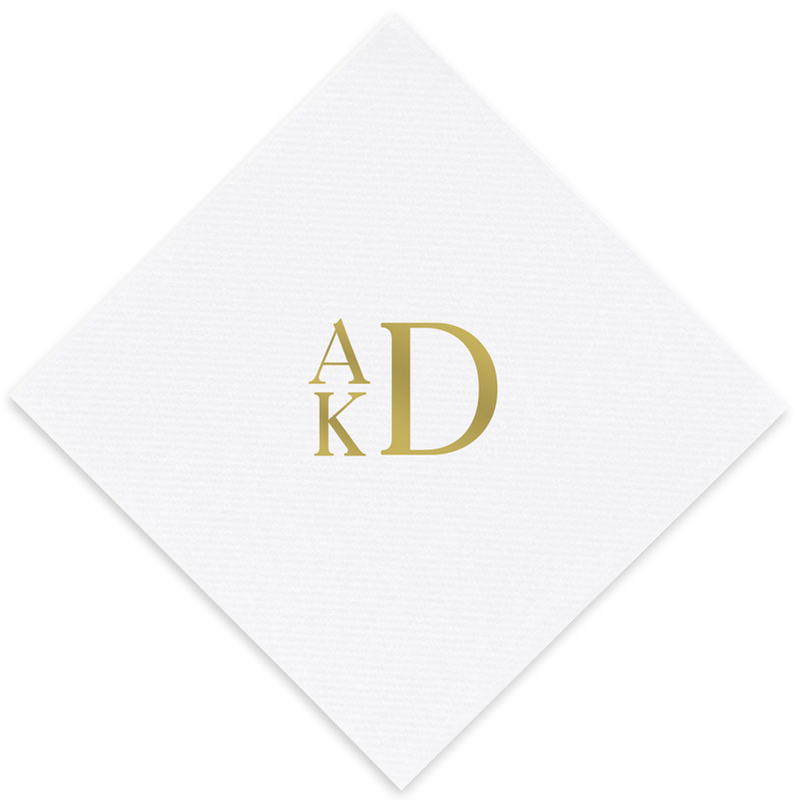 Delavan Monogram Napkin. 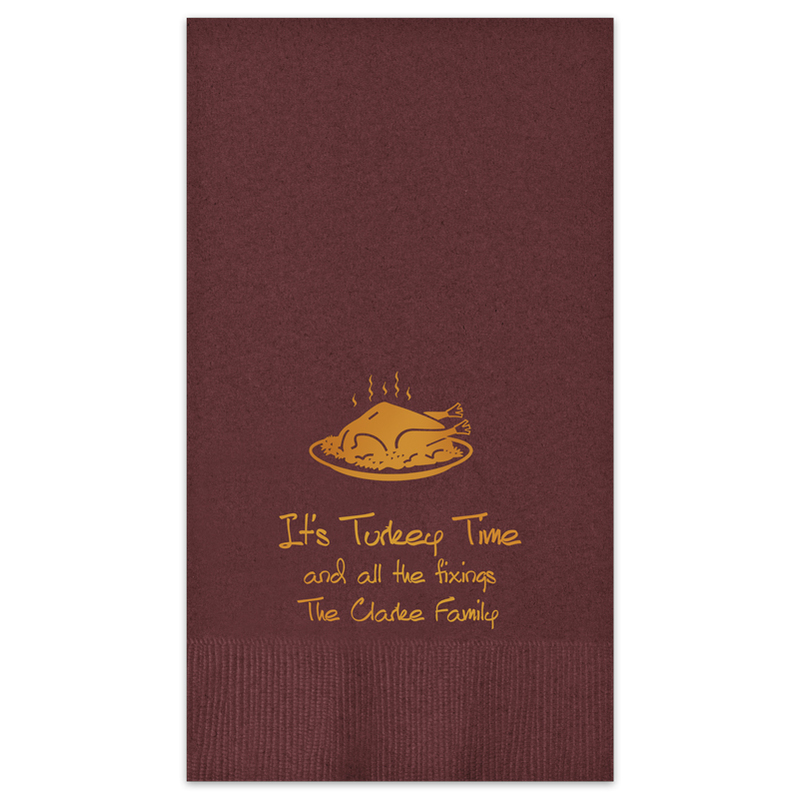 One of our best-selling napkins. 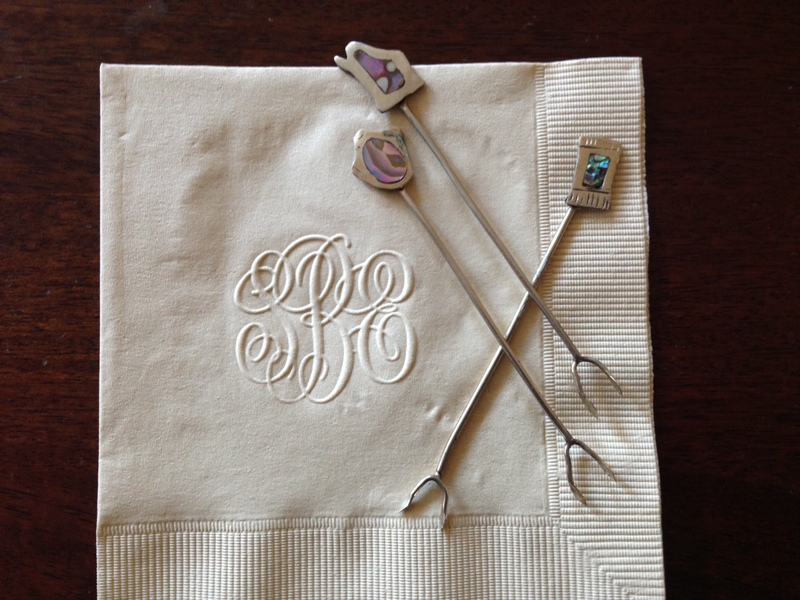 Choose from a variety of monogram designs, as well as either diamond or square napkin orientation. Embossed. Offered in a variety of colors, including white, ivory, coral, pink and purple. Serenity Foil Pressed Napkin. 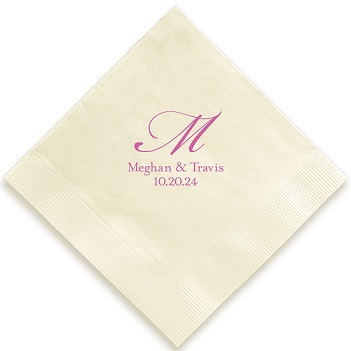 Sophisticated and refined, the Serenity Napkin features two lines of personalization. Choose a lettering style for the text. A single script initial highlights the design. Precision crafted with the utmost care and attention to detail, these napkins come in a large array of colors and vivid foil colors. Bordered edge. Diamond orientation. Explore our entire collection of napkins and guest towels. A steaming turkey or ham. A blazing fire. Children’s excited laughter. The sights and smells of holiday parties warm the heart and soul. Your table is the center of all the action. Be sure to have plenty of holiday napkins on hand for sticky fingers and wet beverages. The embossed Delavan Monogram Napkin. Planning the perfect holiday feast? Our napkins come in a large array of foil ink colors and paper colors to match any decor. 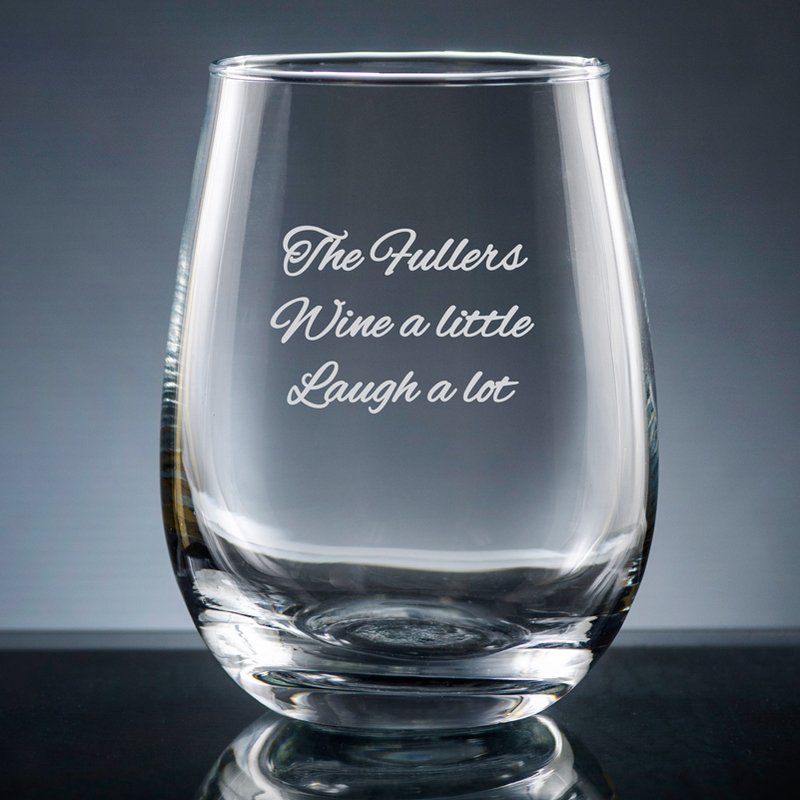 Use them for the buffet table, dinner table, beverage cart or passed appetizers. 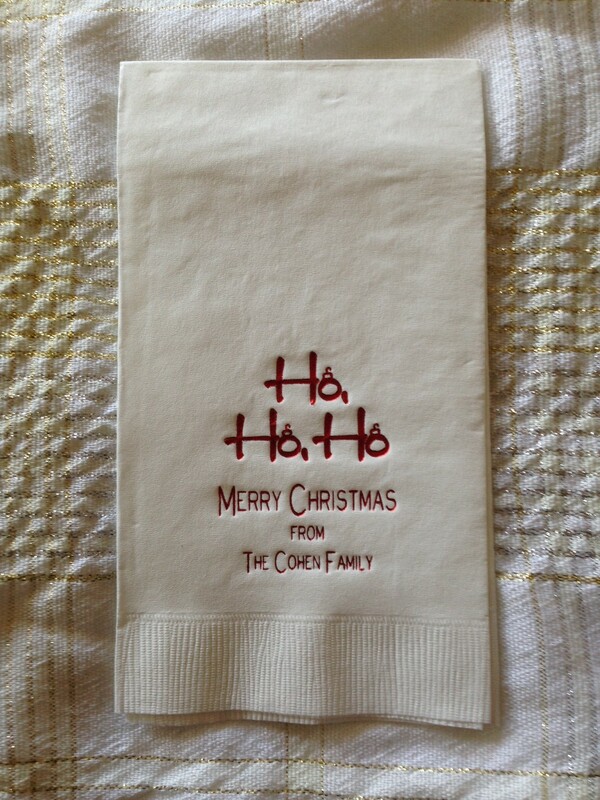 Christmas Napkin. Three lines of personalization. Choice of lettering style. Motifs include: candy canes, Christmas tree, stocking, ornaments, Santa’s hat and holiday wreath. High quality, three-ply construction. Also available in an embossed version. Delavan Monogram Napkin. Monograms signal tradition and taste. 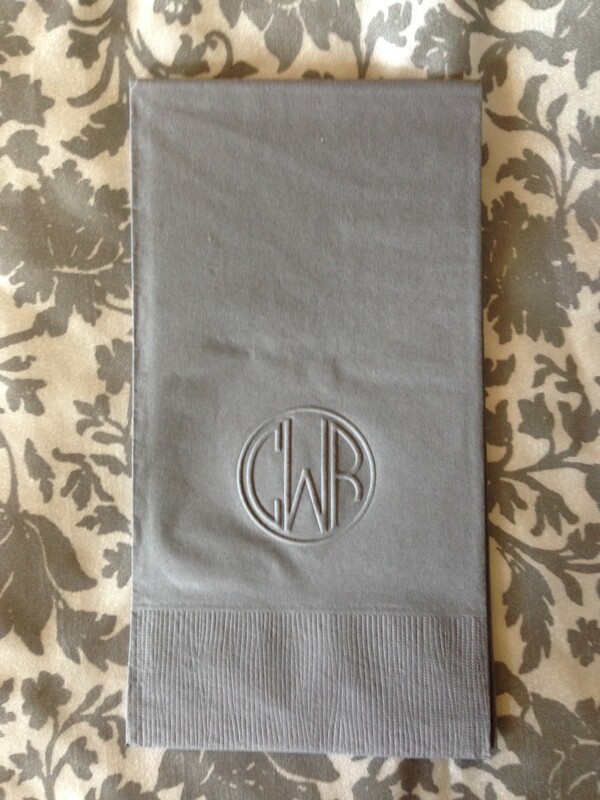 Impress your guests with the Delavan Embossed Monogram Napkin. 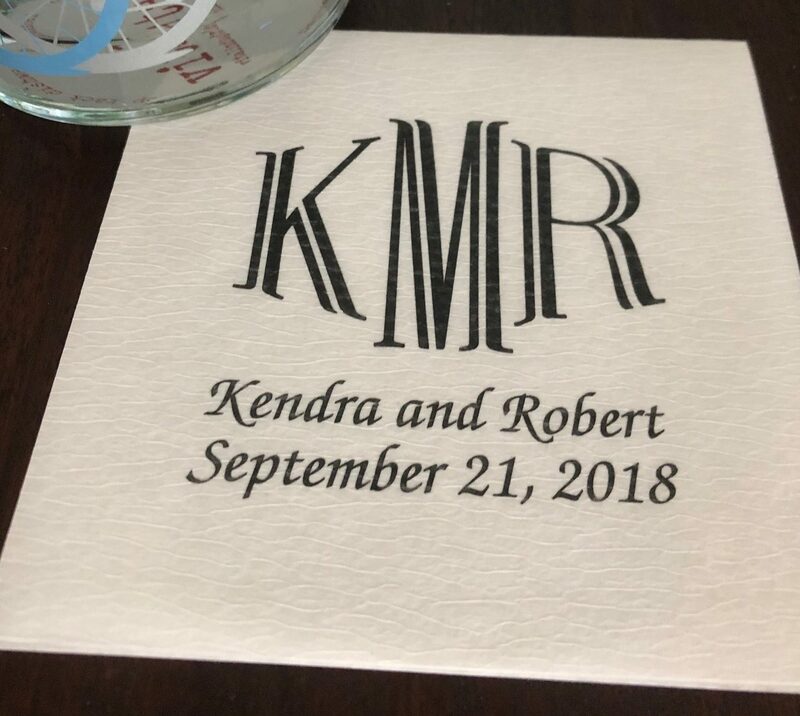 Choice of monogram, paper color and napkin orientation: diamond or square. Bordered edge. Also available in a foil-pressed version. Add pizzazz to your buffet table or powder room with Giftsin24.com’s wide range of personalized guest towels. We ship both embossed and foil-pressed items in 24 hours. Yuletide Guest Towel. Coming home for Christmas dinner to celebrate family style. Gathering for the annual holiday office party. 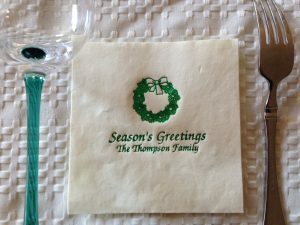 There are as many ways to customize the Yuletide Foil-Pressed Guest Towels as there are reasons to celebrate. Personalize these paper party serviettes with up to three lines of text. Choose a foil ink color, typography and paper color. Motifs include: snowman, Rudolf the red-nosed reindeer, ho-ho-ho and snowflakes. Also available in an embossed version. Delavan Guest Towel. From the powder room to the buffet table and more, the Delavan Embossed Monogram Guest Towel is the perfect accessory. Offering a choice of monogram and paper color, this guest towel offers endless options. Bordered edge. Also available in a foil-pressed version. 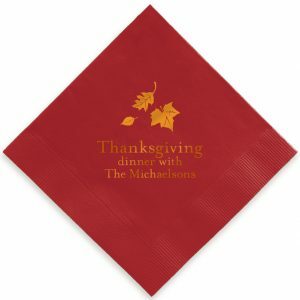 Personalize our Autumn Napkin to create beautiful Thanksgiving Day Napkins. Brighten up your party table with personalized Thanksgiving day napkins. This beautiful holiday celebrates gratitude and family feeling. 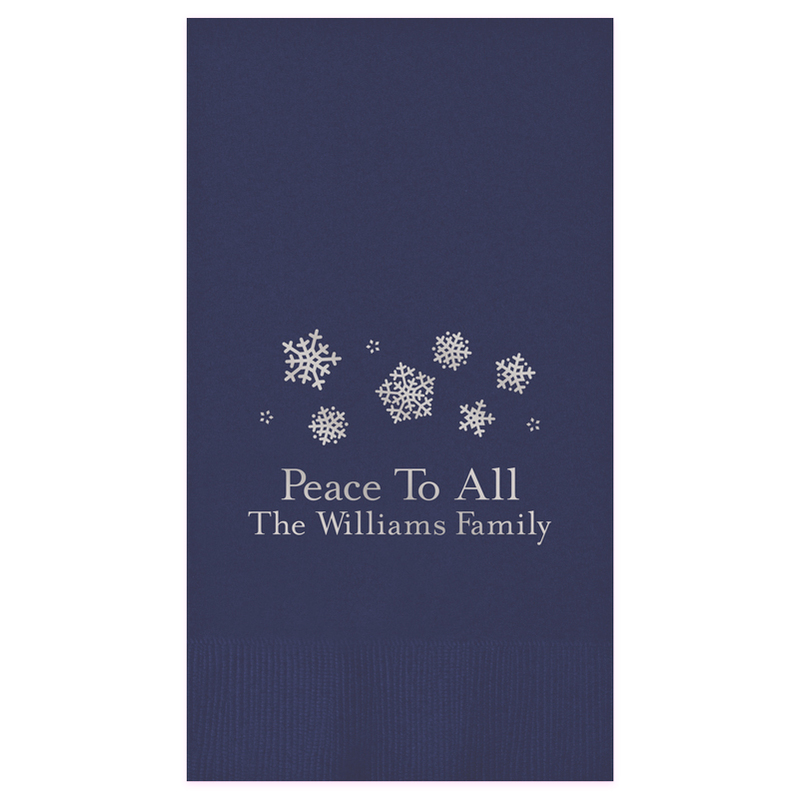 Announce your family pride with personalized napkins. We have created many exciting new designs that will tie your table decor together and even add a little sparkle. And with two sizes to choose from — a 4.75″ by 4.75″ napkin or a 4.5″ by 8.5″ guest towel — you can deploy them to the snack table and bar as easily as the dinner table or powder room. Autumn Guest Towel: Strike a warm and inviting note on your party table or powder room with the Autumn Foil-Pressed Guest Towels. These paper serviettes come in a large array of foil ink and paper colors to match any decor. Three lines of personalization. Choice of lettering style. Motifs include: fall leaves, harvest cornucopia and turkey. High quality, three-ply construction. Bordered edge. Also offered in an embossed version. Autumn Napkin: For all of Fall’s celebrations add pizzazz to your party table or bar cart with the Autumn Embossed Napkins. These napkins come in a large array of colors to match any decor and offer up to three lines of text and a choice of lettering style. Motifs include: turkey, fall leaves, harvest cornucopia and pumpkins. High quality, three-ply construction. Also offered in a foil-pressed version. Autumn Guest Towel in mocha with gold foil ink. 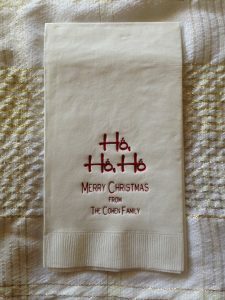 Joyous Napkin: Perfect for holidays, weddings, birthday parties and more. Tell everyone why you’re celebrating with four lines of text in the font of your choice. These napkins come in a large array of colors and vivid foil hues to match any decor. High quality, three-ply construction. Square orientation. Bordered edge. Create fun company picnic napkins in just a few minutes. Your company picnic is an expression of unity and togetherness. It’s a chance for folks to kick off their leather work shoes, don some sandals, and get a chance to chat. 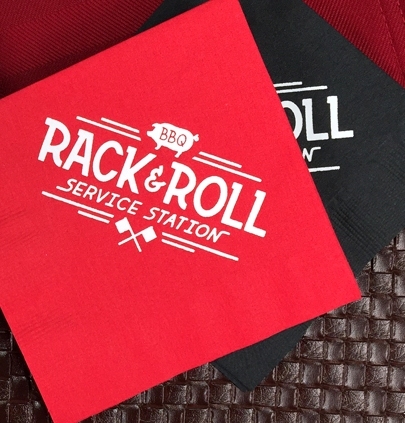 Napkins are an easy and affordable way to add some color and your corporate logo to the festivities. 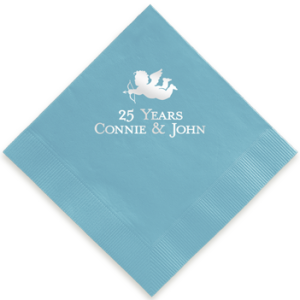 We offer two sizes: 4.75″ x 4.75″ beverage napkins and 4.25″ x 8.25″ guest towels. Choose from an array of foil colors and paper colors to reflect your corporate colors or party theme. You can easily upload your logo file with our clear instructions. Don’t want to take the time to upload a logo? We offer text-only napkins , as well. Custom Foil-Pressed Napkin. 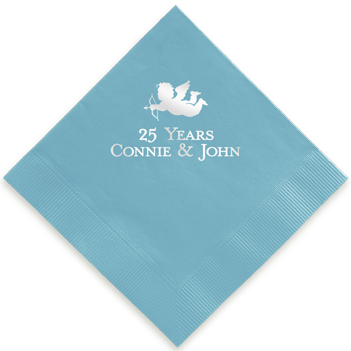 Upload your logo in a specified file format and choose from a wide selection of napkin colors and foil colors to reflect your company colors. We can orient the design in either square or diamond format. 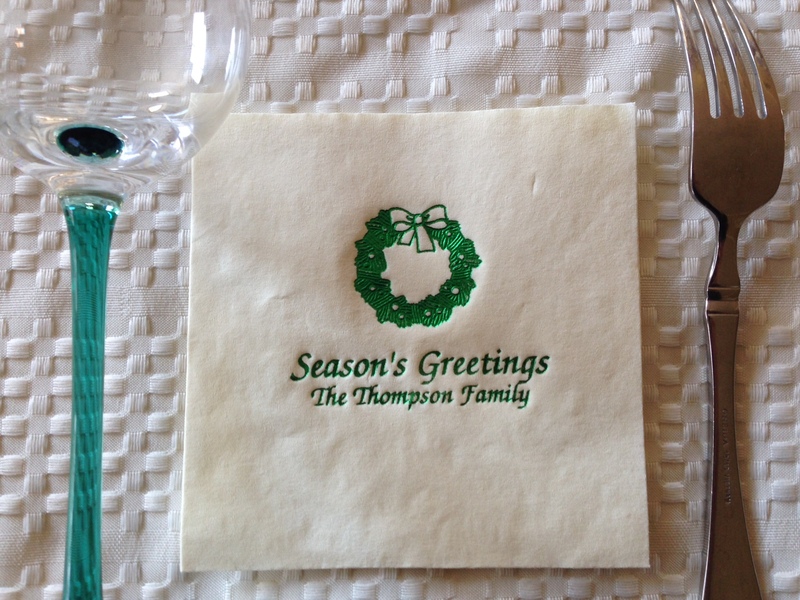 Custom Embossed Napkin. 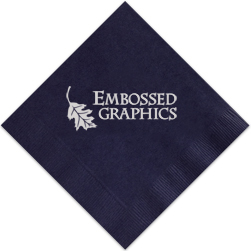 Feature your company logo on these embossed, high quality, three-ply napkins. Choosing from a wide selection of napkin colors to reflect your company color. Offered in either a square or diamond format. 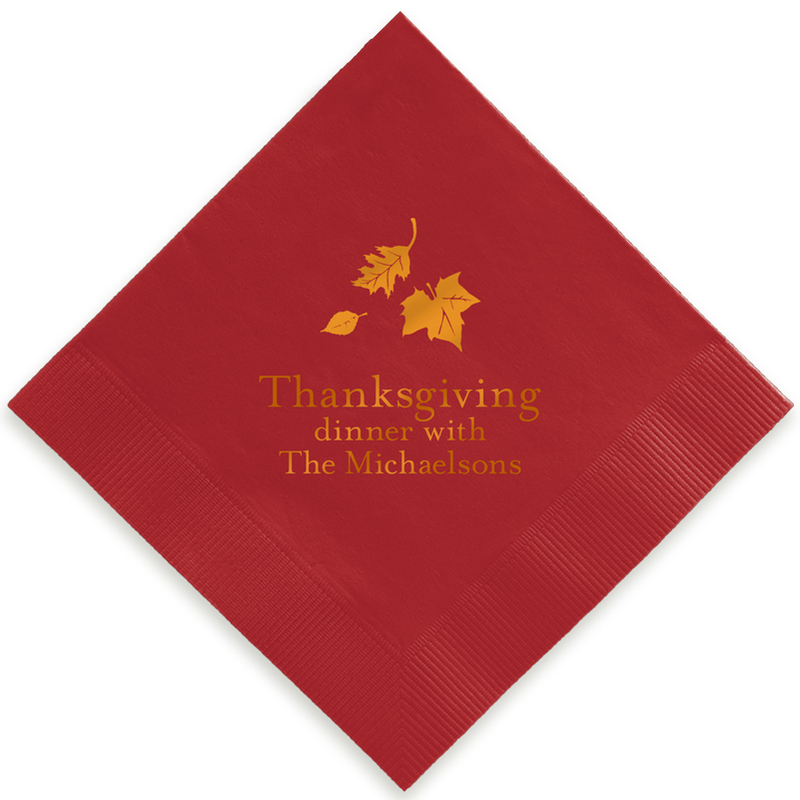 Personalize our Custom Foil Napkin with your company logo. Then choose a festive color for your company picnic. Custom Foil-Pressed Guest Towel. For a larger napkin, choose our guest towels. We offer the same vivid foil colors and an array of towel papers so you can create a winning combination. Expression Foil-Pressed Napkin. Our Expression Foil-Pressed Napkin offers three lines of text, enough for your company name, the words “Company Picnic” and the date. You don’t have to worry the extra step of uploading a logo. Just order as you would normally order any of our personalized products. Cupid Foil-Pressed Napkins can be customized with your personalization and printed on pink, red and white paper. We offer a variety of foil colors too. Our personalized party napkins make the perfect accessory for your Valentine’s Day party table or buffet. Whether you enjoy a pastel pink decor complete with candy hearts, or a more elegant theme of white and red, we’ve got napkins that will add polish to your party table. We have a range of colors to match any theme or decor. Some of our favorite paper colors for Valentine’s Day include Classic Pink, Hot Pink, Red and White paper. You can have them embossed with your monogram, family names, “Happy Valentine’s Day” or whatever cute saying or phrase floats your boat. 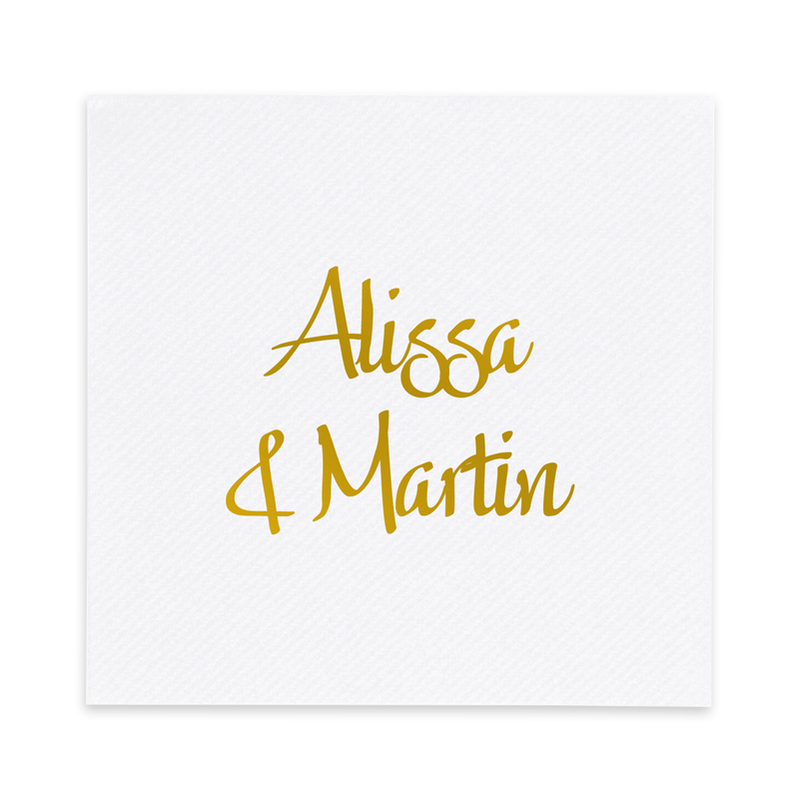 Another option is to order napkins with a foil-pressed design, for which you might choose Silver, Gold, Red, Pink or Bright Pink for the lettering or design. Black and Red are also a classic combination for Valentine’s Day. We have a range of motifs, including champagne flutes, cupids, monograms and other designs that set the tone for your party. 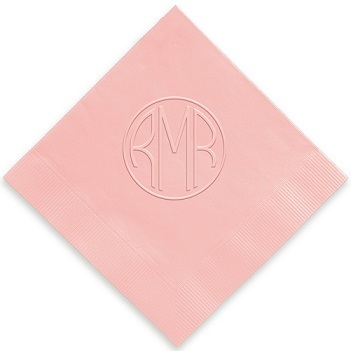 Delavan Monogram Foil-Pressed Napkin is flirty and elegant. 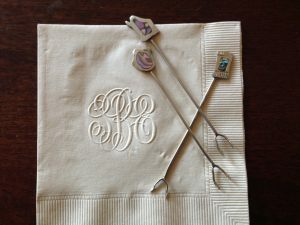 Dress up this napkin in so many ways by choosing from a range of monograms with unique personalities. Cocktail Foil-Pressed Napkin sets a festive, convivial tone with lots of party-themed motifs. 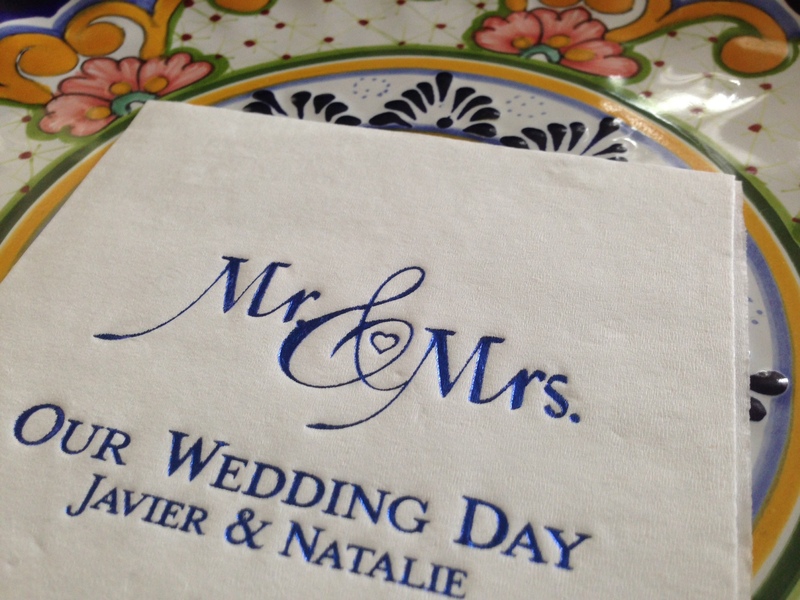 Nuptial Foil-Pressed Napkin features a range of romantic motifs. So fun! Peruse our entire selection of party napkins as well as coordinating guest towels here.